Manufactured in aluminium with a powder coated finish. The seat and back are finished in high density foam, covered in a flame retardant, wipe clean material. 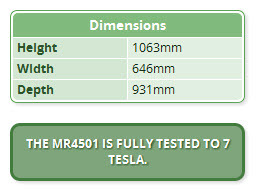 MR Conditional for use up to and including 7 Tesla. Fitted with non-marking, low rolling castors. Up and down (below seat level) armrests allowing easier access and patient transfer. Retractable footrest with anti-slip covering. Safely transports patients up to 220kg (490lb).